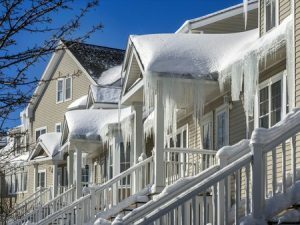 What Can You Do to Prevent Ice Dams on Your Roof? 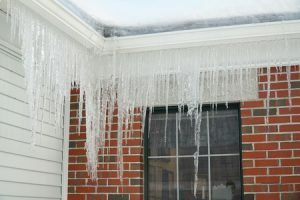 Ice dams are one of the most common causes of roof and gutter damage during the winter. Ice dams typically form near a home’s roofline as a result of residual heat in the attic. The heat from the attic causes snow and ice on top of the roof to melt, but when the water runs down the roof and reaches the edge, it stops and re-freezes. The resulting ice can then trap more water, and ultimately lead to huge, heavy ice dams that pose a threat to your roof and gutter system. The good news is, there are a few steps you can take to prevent ice dams from developing on your roof this winter. Prevent heat buildup in the attic. On cold days, it’s important to keep heat contained in your home and prevent it from building up in the attic. Keep attic doors closed, and consider having your attic inspected for sources of heat loss such as gaps in drywall and spaces around light fixtures. These gaps should be sealed to maintain a consistent temperature in the attic. In addition to sealing your attic space, you should also be sure to inspect the condition of your attic’s insulation. If there isn’t enough insulation, or if the insulation is worn and damaged, the attic will be more likely to experience extreme temperature fluctuations. This, in turn, can make your roof more prone to ice dam buildup. Make sure the attic is properly ventilated. Do you have enough vents in your attic? If not, warm air might be getting trapped there on cold days. Proper ventilation can help maintain the temperature equilibrium in your attic, thereby preventing the roof from warming up and generating ice dams. As a general rule of thumb, you should have 1 square foot of vent space for every 300 square feet of attic floor space. If your gutter system is damaged by ice dams this winter, the team at Bell Seamless Gutters can help. Give us a call or contact us online to learn more about our repair and replacement services today! The winter season can wreak havoc on the exterior of your home. The freezing-cold temperatures and snow can damage everything from sidewalks to roofing, and winter can be especially harsh on your home’s gutters. 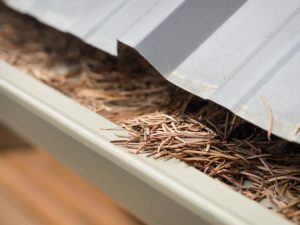 If you aren’t careful, you might even need to replace portions of your gutter system in the spring. Fortunately, there are simple steps you can take to keep your gutters safe this winter. Clean your gutters in the fall. During the fall, your home’s gutters can get clogged up with leaves, twigs and other debris. If left unchecked, these clogs can cause water to back up in your gutters and allow large ice dams to form in the winter. Clean your gutters in the fall to prevent ice dams from forming and doing serious damage to your gutter system. Prevent snow from building up on your roof. If possible, don’t let large amounts of snow sit on your roof for weeks at a time. At the very least, you can use a roof rake to knock off snow that accumulates near your gutter system. Keeping your gutters free of snow will help them to do their job more effectively and prevent damage during the winter. Inspect your roof and gutters regularly. Keep an eye on your roof and gutters throughout the course of the year. If you spot any gutter sections that are pulling away from your home or falling off, call your local gutter company to have them repaired sooner rather than later. This way, you can rely on your gutter system to function effectively when you need it most. Do your gutters need to be repaired before winter sets in? Bell Seamless Gutters can help. Give us a call today at (800) 597-1616 today to schedule a consultation and learn more about all our seamless gutter options.